It can be said that the essence of science is deconstruction: taking apart nature, machines, and theories to see how they work. This is by no means limited to the natural sciences — the ideologies, philosophies, and abstractions of the social sciences and humanities behave in a similar way. It is this all-encompassing nature of the theme of this year’s TEDxUofT conference — ‘deconstruct’ — that allowed a host of fascinating speakers to tackle issues from across the board. Now in its seventh year, TEDxUofT is an independent branch of the larger TED media organization. Having rapidly outgrown the St. George campus’ Isabel Bader Theatre and JJR Macleod Auditorium, this year’s event was hosted at the downtown St. Lawrence Centre for the Arts. The conference left Earth entirely with Dr. Matt Russo, who took the audience through a symphony of the heavens with his guitar and orbital data. Russo is an astro-musician and founder of SYSTEM Sounds, a project that translates the natural rhythms of space into appreciable music. U of T cognitive science professor John Vervaeke addressed the theme introspectively. “Modern science is deconstructing the mind,” said Vervaeke, as he listed the vast number of fields — psychology, neuroscience, and linguistics, to name a few — that seek to define the mind, all in different ways. To round off the literal deconstructors, Professor Jay Pooley of the Faculty of Architecture explained how his life consists of taking things apart and putting them back together, both professionally and for his art. Pooley is behind familiar productions like the awareness campaign by the Hospital for Sick Children where children are depicted smashing their way through representations of adversity. “In a way – deconstructing is just as important as constructing!” wrote Pooley to The Varsity. The conference was not limited to the literal — speakers also explored deconstructing the human constructs of society, identity, and ideology. U of T alum Dr. Kona Williams described the systematic plight of First Nations people in the country. As Canada’s first Indigenous forensic pathologist, Williams spoke at length about how Indigenous people suffer from entirely different causes of death from the rest of the population. “Indigenous people have a history in Canada — take what you believe you know, dissect your thoughts, and rebuild with new knowledge. You’ll always learn something new,” she said. Racial oppression was tackled from another angle by Syrus Marcus Ware, a leading member of Black Lives Matter Toronto and the Art Gallery of Ontario’s coordinator of youth programs. He spoke passionately about what he described as the “fungibility” of Black bodies and how he and other Black artists convey their struggles through their art. “Art is a street medic… [it helps] people on the front lines,” said Ware. While society’s deep-seeded problems were on display, there was positivity among social agents of deconstruction as well. U of T PhD student Sasha Weiditch engaged the audience in her talk about what it means to be a scientist. Despite her previously internalized stereotype of the lab-coated, bespectacled, crazy-haired scientist, Weiditch now works to convince others, especially girls, that “scientist isn’t a term reserved for people with three degrees and high IQ.” Weiditch explained that social media allowed her to deconstruct her own research and experiences. Finally, there was a distinct category of speakers who sought to neither deconstruct the mysteries of science and technology nor the problems of an evolving society, but rather address the elementary problem of relating to others. Undergraduate student Jeremy Wang, Chief Technical Officer of drone-manufacturer The Sky Guys, called for those involved in the application of technology to have a deeper empathy for those in public relations or management. “I think there’s a lot of confusion and a lot of messy emotions that go into workplace conflict… [but] at the end of the day we’re all people, [and] we all have to work together somehow,” said Wang. Both the darkness and the light of human interaction was addressed by graduate student Dr. Khaled Almilaji, a humanitarian physician from Syria. Almilaji was in the media spotlight last year after being denied entry to the US. Unable to continue his studies at Brown University, he was invited to continue at U of T and gave a talk about the power of volunteerism. He described how volunteers could make the worst situations bearable. Capping off the eclectic collection of experts was professor Dan Dolderman. A beloved instructor of first-year psychology courses, Dolderman delivered a post-modern blend of poetry, drumming, and singing, and called for unity in addressing deeper topics like climate change. “I was deconstructing the process of societal transformation and I think it starts with the expression of vulnerability and the acceptance of that by the listener,” said Dolderman. TEDxUofT 2018 also featured the tunes of The U of T Jazz Orchestra and the Tunes, Beats, Awesome a capella group. “Music is always about deconstructing and reconstructing, just by the fact of learning a piece to perform,” explained Gordon Foote, the Jazz Orchestra conductor and Faculty of Music Associate Dean, Performance and Public Events. Like a fine epoxy, the 12 extraordinary presenters were glued to the theme of ‘deconstruct,’ down to the musical scene. 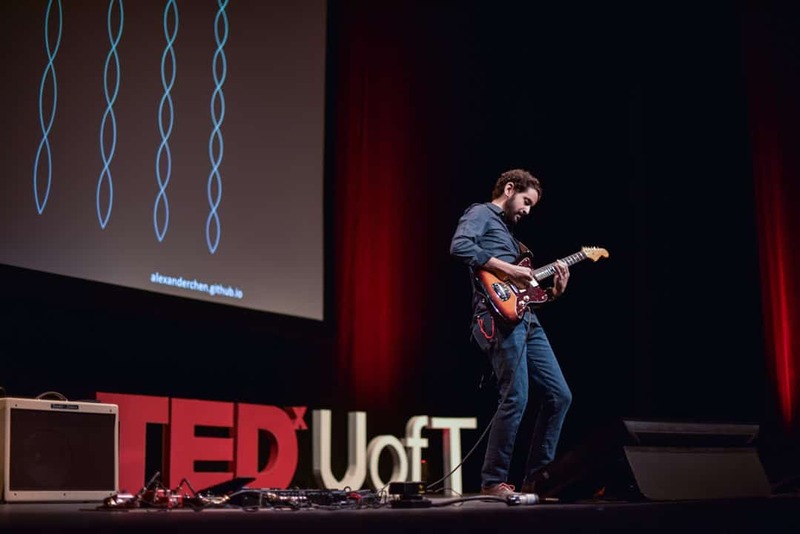 Editor’s Note (March 18): A previous version of this article incorrectly stated that TEDxUofT was in its sixth year. TEDxUofT is in its seventh year.